Slogging through mud and climbing over hurdles during a summer 5K mud race was one of my first outings with Rory Anderson, a new friend whom I had recently gotten to know at Cedar Ridge. The race together is a fitting metaphor for the sometimes uncomfortable and messy work that is involved in transformation of any kind; yet despite the challenges, the greater rewards are mutually satisfying relationships that foster growth. For Rory, the dialogue around issues of race and reconciliation began prior to attending Cedar Ridge. 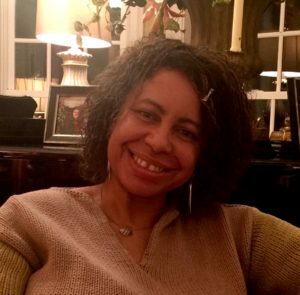 As a board member of Kingdom Mission Society (KMS)–a ministry non-profit which brings Christians together on concerns around injustice and spiritual renewal–Rory is familiar with the nuances of these kinds of conversations. Where sensitivities run deep, Rory emphasizes the need to set aside ego, which is so easily pacified by looking for something we can do; we must equally focus on the process of inner transformation. This means doing our own work in both prayer and study, including reading, watching movies; challenging our own assumptions about others, and becoming willing to enter into the discomfort that is necessary to bring about healing, reconciliation, and lasting change. “The seeds were planted early,” Rory recounted. She described how some of her earliest conversations with Matthew Dyer, Lead Pastor, opened the door for a discussion that would follow as racial injustices were more widely publicized following the 2013 acquittal of George Zimmerman in the slaying of Trayvon Martin; and later, with further killings of other unarmed black men and the resulting protests and riots in Ferguson, Missouri, Baltimore City, and the shooting of black congregants in a church in Charleston, SC. Together with others who were also grief-stricken and devastated about the Trayvon Martin case verdict in the summer of 2013, Rory approached Matthew. At the time, Rory admits she had hoped for a more immediate response, but now appreciates the slow and thoughtful way in which issues of race and reconciliation have been brought to the forefront at Cedar Ridge. Beginning with a series titled, “Justice For All,” during January of 2015, we began to explore a broad range of social justice issues through a study on the book of Amos. The next series took a closer look at issues of racial injustice in the Spring Discipleship Series, “Becoming a Movement of Love, Peace, and Hope,” which included a panel discussion on racial justice. Rory agreed to participate during two Sunday morning services; first, during the Amos series, wearing a hooded sweatshirt as she would on a morning jog, Rory issued a challenge for us all to consider the misjudgments that can pose real danger to African Americans. 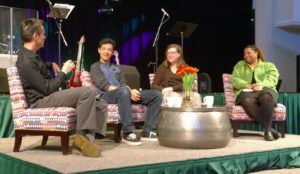 During the Spring series, Matthew and Rory began to have an honest on-stage conversation and dialogue with the congregation about race and the Church. Since that time, a summer forum during June of 2015 was held to further explore issues of justice. A team focusing on race and reconciliation was later formed for the purpose of determining ways of engaging our community on these issues with thoughtful leadership and planning. Attendance at a recent screening and discussion of Martin Luther King, Jr.’s “I Have a Dream” speech was an encouraging indication that the people of Cedar Ridge are listening as 50 plus people gathered in the Barn on MLK Monday, January 18. As our conversation over the phone came to a close, Rory’s heart was evident. “The work of change is slow, hard, work precisely because it’s personal.” In her own journey over the past couple of years, she has learned and been able to share more of herself, and built more meaningful relationships in our community by not shying away from the discomfort that honest conversations around race can so easily create. Her hope is that we will continue to create a life-giving, safe space for education and dialogue in order to lay the foundation for broad and lasting change. (This article was originally published in the Winter edition of The Quarterly Newslerter.) Subscribe here.